… is very clear in its tone, and answers well for experiments with the phonograph.” The ocarina featured in many early recordings on Berliner discs, Edison cylinders and 78s. 2. Mosé Tapiero recorded dozens of virtuoso ocarina 78s in London between 1908 and 1910. If his virtuosity had been on any other instrument, he would have been an international superstar ike his close friend, opera singer, Luisa Tetrazzini. Instead, he remained relatively unknown, other than to the worldwide record buying public, playing on cruise ships between Europe and South America. Their playing outshone that of a pit orchestra that included Benny Goodman, Gene Krupa, Glenn Miller & Jimmy Dorsey. The Foursome continued close harmony singing and ocarina playing on radio and film through the 1940s & 1950s. 4. Harry Berly played ocarina in numerous London dance bands during the 1920s and 1930s. His ocarina break in Whispering remains a classic to this day. for their 1940 film The Road to Singapore. the 1950’s musical included ocarina solos and an ocarina group as part of a spectacular dance sequence. 7. The Troggs 1966 hit Wild Thing features an unlikely ocarina riff played by lead singer Reg Presley. It is thought that the slightly sharp tuning of guitars for this number was solely to accommodate the pitch of Presley’s ocarina. with his 1986 ocarina soundtrack to the television film ‘The Great Yellow River’. 9. Paul Senneville’s Song of Ocarina, released in 1991, sold 1.5m copies in France and a further two million in 44 countries worldwide. 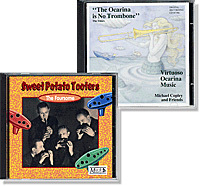 The subsequent album ‘Ocarina’ replaced Michael Jackson’s ‘Dangerous’ at the top of the French album charts in March 1992.
and countless other touring ocarina groups around the world have produced great recordings over the last 30 years.